It appears that all I needed to be able to concentrate on one project was to blog about how I couldn't focus. After my last post, I devoted myself almost entirely to my blue shawl, which is now thisclose to being finished. The bind off is one that takes quite a long time, though I think it's worth it. I'll finish this up first thing this evening. I think I mentioned that there's a little bit of colorwork on the border of this one, and I'm finding that I like the reverse side of it just as much as I like the front, so I think I might be using this stitch pattern again for something that could be reversible. As soon as the shawl is done, it'll get blocked. Then all I need to do is take some measurements, weigh what's left of my yarn to figure out how much I used, and take some photos to put the finishing touches on the pattern. Yesterday the third clue of the TTL Mystery Socks was released (well, technically it was released Tuesday night, but I didn't look at it until yesterday morning). I took my socks to work and was able to get the first heel done and the second heel started. The second heel was finished last night, so these will now be put aside until next week, when we'll get the foot portion. I had a brief moment of panic after I finished turning the second heel last night when I thought for a minute that I'd have no lunchtime knitting for today (I have a couple of things I want to start, but yarn needs to be wound for them). Then I remembered that I've been neglecting Rainbow's scarf, so that went into my project bag and saw some action today. I think that if I can stay focused on it for a few days at least, it stands a good chance of getting finished in the near future. For a while there I was starting to think that I had too many projects on the needles, but it turns out that I needn't have worried! I love it when it all works out like that. It must be this cold weather that's doing it to me, but I can't seem to stay focused on any one project lately, and as a result, nothing seems to be moving. I mentioned the other day that I'd started a scarf for Rainbow, but it's been pretty much untouched since then (though I really should get a move on so it will actually be useful for her). The past two nights, I've worked on Rainbow's sweater, which now has a couple of sleeves and the beginnings of the body (not pictured, because it's just a few rows of ribbing at the moment). 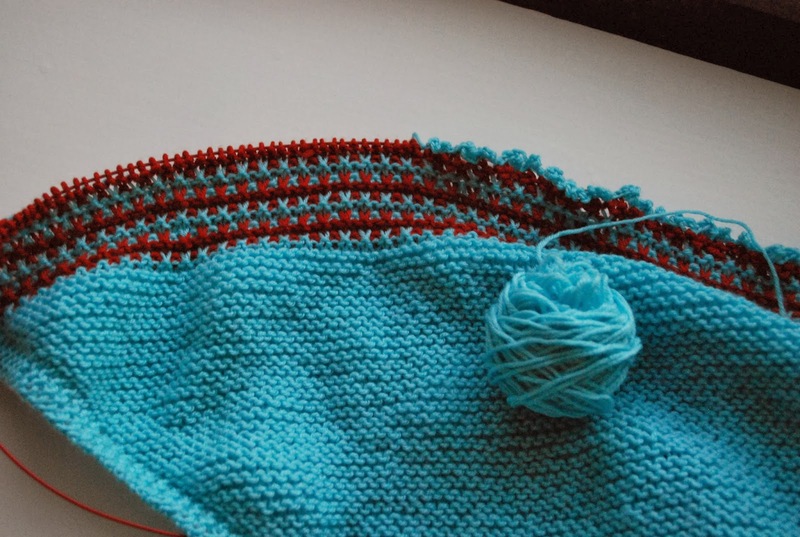 I've also been putting in a row here and a row there on that blue shawl I've been knitting, which has finally gotten to the point where I can add in the second color. But that's been my lunchtime knitting and will probably get put on hold once I get the next clue for the mystery socks. As if all these WIPs weren't enough, I'm getting a really strong urge to cast on for a new hat for me, mostly because the Koolhaas I've been wearing doesn't seem to actually want to stay on my head anymore. I'd really like to knit myself a Wurm using a skein of my handspun. Oh, and spinning! Now I want to spin all the time! If only I could stay home and be surrounded by yarn and fiber all day -- I could get a lot more done! Perhaps when I retire I'll be able to do it, but that's a long way off. After barely touching my wheel all week, I gave it some good attention this weekend and have a second bobbin of rainbow colors to show for it. I also started in on the third bobbin and have broken into the second color, so I'm well on my way to finishing that. I'm hoping to spin at least two evenings this week so that I can ply next weekend. One of my goals for the year was to knit more with my handspun, and I'm happy to say that the project I cast on for yesterday is just that. It's not much, but it's a start of Rainbow's scarf. The fiddly parts are done (at least until I get to the other end), so now it's pretty much mindless knitting in the round. The yarn is really soft and fuzzy, and I'm really hoping I don't spend all this time only to have her tell me that it's scratchy! That darn Polar Vortex seems to have struck again, so I am finding that I want to cover myself in every handknit object I own. Even Rainbow -- who I often refer to as "my little furnace" -- has requested that I make her a scarf. I think I've found a suitable pattern (I wanted something short to avoid any strangulation risk), and she has picked out a skein of my handspun, so I'm hoping to cast on this weekend and whip it up quickly so she can wear it while the frigid air is here. Meanwhile, I'm working on more handknits for me. The second clue for the TTL Mystery Sock was released a day early, and I had planned to start in on it during my lunch break yesterday, but apparently it's cold enough to freeze my brain and I forgot to swap out my project bags. That meant that I didn't get to start in on them until after Rainbow was asleep last night. I've nearly gotten through the leg on the first sock and will tackle the second one tonight. Daylight photo brought to you by my camera phone! These are pretty darn fancy, and I'm glad I'm using some of my extra-precious handspun for them. The yarn itself feels a little delicate, as does the patterning, so these will be special socks that don't get worn every day. Yesterday we all had the day off, so I took the opportunity to start a sweater for Rainbow. I'd long had Little Oak in my favorites, so when I heard that the Knitmore Girls were doing a "matchy matchy" knitalong, I decided that it was the right time to knit it. I'd already made myself a Gnarled Oak Cardigan in tosh dk last year, so now Rainbow and I will have (sort of) matching sweaters. I didn't have any appropriate yarn in my stash already, so I allowed myself to go yarn shopping for this one. My LYS has stopped carrying madelinetosh yarns (mostly because of a supply issue), but they've recently brought in a new yarn that's a really excellent substitute -- Yarn Hollow Tor DK. This yarn is 100% superwash merino and has the same color quality of madelinetosh. I've only knit part of a sleeve and I already love it. I'm following the wisdom of the last sweater I knit Rainbow and starting with the sleeves, as I find it much easier to put those stitches on holders and have the body stitches on the needles when I join for the yoke than vice versa. The first sleeve should be finished tonight and the second one started. My gauge is a tad bit off (I'm getting 22 sts/4 in. with a size 4 needle, whereas the pattern calls for 24 sts/4 in. using a size 6 -- Alana Dakos must be a loose knitter!) but I'm using that to my advantage. I'm knitting the size 4, but I really wanted to make something a little larger than that because Rainbow's already comfortably in size 5 clothes. The size 6 seemed a bit too large, but this should allow her to have a little room to grow. Hey look, I finished a pair of socks! Pattern: loosely based on Monkey by Cookie A. These were cast on while we were still on vacation in Florida and were my travel knitting. The first sock was nearly done by the time we get back, but the second sock took a bit of extra time to do once I started back at work and only had my lunch break to work on them. In any case, I'm happy they're done, as they're going to make a very welcome addition to my sock drawer. 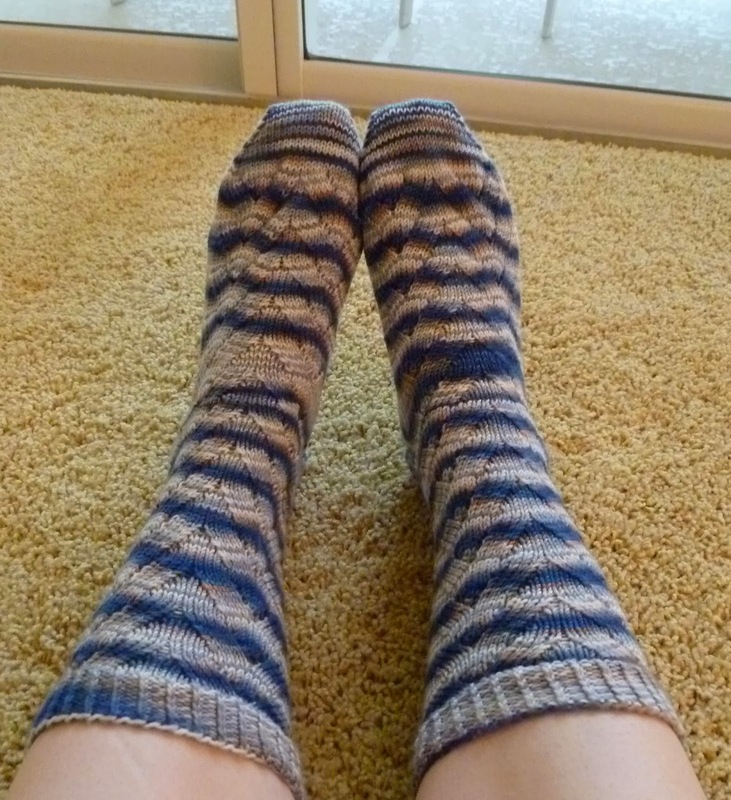 As for the pattern, I started with the no-purl Monkey socks that seem to be my default (other than plain stockinette). I thought I'd try a little something different this time, so after I did the first pattern repeat normally, I shifted where I started in the pattern for the second repeat, starting with stitch 9. I alternated the normal pattern with the shifted pattern, so you can see that there's an effect of wavy lines. My other modification was to add the reinforcement to the sole near the ball of my foot in an effort to have these last a little longer. I have been dutifully exfoliating the problem spots on my feet, but I figured it couldn't hurt to try this out for some extra protection. I essentially did Eye of Partridge stitch on the sole stitches only for the last two repeats of the foot (right before the toe). It definitely made the sole side of the sock denser and perhaps a little shorter than the same area on the instep, but it doesn't seem to be that noticeable. Time will tell if it's actually an effective strategy. I was in a bit of a hurry to finish these because I wanted to use the needles for the Through the Loops Mystery Sock, which kicked off yesterday with the first clue for the cuff. I was able to get both cuff done by the evening, so now I'll have to wait until next week for the next clue. The cast on was a bit tedious but very fun looking, so I'm excited to see what comes next. I'm using my own handspun -- the first time I've knit with yarn that I spun on a spindle, actually -- and I'm reminded yet again what a joy it is to knit with yarn I've spun myself. I really need to make a point to do it more often. Two, Two, Two Hats in One! This was a fun knit, although my plan to use up scraps was partially a dumb thing to do because it meant lots of ends to weave in. I did carry some strands, but I still estimate I had at least a dozen ends to deal with. I wove in some as I went along, so at least I didn't have to deal with them all at the end. I specifically chose this yarn because I thought it would be perfect for a chemo cap -- soft, not itchy, and easy to wash. The scraps were leftover from the Tiny Bubbles sweater I knit for Rainbow when I was pregnant with her -- so, needless to say, they've been sitting in my stash for quite a while! I used up most of what was left, and I think what's still enough not to throw away will be useful as ties for my handspun when I skein it up. This hat was so busy that I thought I should do a relatively plain one that I could knit up in an evening or two and throw in the package. I still had a random skein of Wool-Ease in my stash (I bought two on clearance at Michaels maybe a year ago that I figured I'd use for a baby gift or something), so I pulled it out and cast on. It really did take me only a few days to whip this one up. I cast this on at knit night last week and, after a few false starts, managed to get the brim and a bit of the body done that evening. I knit most of the body on Thursday evening and then finished up the crown on Saturday night while rewatching an episode of Sherlock with the Mister. There's not much to say about this -- I knit the pattern exactly as written, and it turned out exactly as I was expecting. Now that these hats are done, I find myself with only one project actively on the needles -- my very bright socks. I'm hoping to finish them up tonight, and then tomorrow I will cast on for the Through the Loops Mystery Sock (the first clue comes out tomorrow). For those I will be using my own handspun, the superwash merino/nylon from the Cupcake Fiber Company that I spun on my spindle during last year's Tour de Fleece. I wound it over the weekend, so as soon as I free up my needles, I'm ready to go. Of course, I can't have just a pair of socks on the needles (particularly if I only have part of the pattern at a time), so I'll have to figure out what to cast on for next. I think I might be another shawl design. Stay tuned. After being away from my spinning wheels for a couple of weeks, I was eager to get back to them this week, so on Monday, I started a new project. At the Indie Knit and Spin last November, I picked up 6 oz. of Polwarth in Rainbow shades -- 1 oz. each of red, orange, yellow, green, blue, and purple -- from Fibernymph Dye Works. I decided to do a traditional three ply, so I split each color into three (roughly) equal parts and started spinning. I've only spent a little time spinning this week, but I'm more than halfway done with the first bobbin. I'm overlapping the colors a bit when I join in a new one, but mostly it goes from one color to the next. The fiber was a bit compacted when I pulled it out of the bag, which made splitting it a bit tricky, so I'm sure the changes won't be at the same spot in all three plies. Meanwhile, I had a bit of a surprise midweek when my last shipment from the Bee Mice Elf fiber club showed up. This one is called Well Preserved, and it's on a delicious blend of 85% mixed BFL and 15% silk -- it should be a dream to spin. Now, I just have to decide how I want to spin it! The title of this post describes how I've been feeling this week. It's always hard to get back to the normal schedule after a long-ish vacation, but this week has been extra challenging. Work has been busy, the weather has been insane, and I just don't feel like I have enough hours in the day to get everything done. Yesterday, for some reason, it occurred to me that after all the work I did to get those baby gifts done before Christmas, I completely forgot to take them to D.C. with us. So I will have to put a trip to the post office on my weekend to-do list as well. Last night was the first knit night of the year, and it was a bit of a miracle that I got there. The Mister has been getting home late all week for various reasons, and I was worried that it was going to happen again last night. Fortunately, he was able to finish up his work at home so that I could go. I took the opportunity to cast on another hat for Halos of Hope, this time using my own pattern (Amberson) and some Wool-Ease that I got on clearance a while back and put away for just this kind of thing. I'll spare you a photo -- it's dark blue, and with no light left here at all, it'll just look like a dark blob. There must have been something in the air in the Barnes and Noble where we meet, because it seemed like everyone was having issues with their knitting (except for one person, but she was fixing a mistake she'd made earlier in the day). I managed to twist my knitting somehow when I joined to work in the round, and after I'd fixed that, I discovered that my cast on number was off, so I had to rip and start over. Fortunately I was able to get back to where I'd been fairly quickly and finished the band while I was still out (I added on a few more rounds when I got home). I don't think this or my other Halos hat will be finished in time to mail them out this weekend, but they should be done by next weekend for sure. I forgot to mention in my last post that I did manage to get the buttons sewn on Rainbow's Antler cardigan and block it. Today was the first day she wore it. I'll have to get her to sit down for some proper photos so I can do an official FO post, but here's a preview. I was a bit worried about it fitting oddly, but blocking seems to have done the trick for the most part. The very bottom is still a little snug over her little belly, but I also added length to the body so that it would fit her longer, and I expect as she grows up it will be less of an issue. Blogger tells me that this is my 1,000th post. Kind of crazy, but I guess it's also not that surprising given that I've had this blog for more than eight years now. When I started it, I never realized how much I could talk about yarn, knitting, fiber, and spinning! In any case, like much of the country, we're in the middle of the extreme cold, so right now all I want to do is cover myself in wool. It's fitting that I'm working on socks, because my feet are usually the one part of me I have trouble keeping warm during the winter. I've been continuing to find weak spots in more of my socks, all in the same spot, and I've come to the conclusion that it's the fault of a big callous I have on my left foot. I'm not sure why one foot is worse than the other, but I have a persistent rough spot right on the ball of that foot. I am trying to be more diligent about exfoliating it in the shower every day, but I also thought I'd try a bit of an experiment with this pair of socks. In the area of the sock that will cover this callous, I'm doing a slip stitch pattern on the sole stitches for added reinforcement. It's much like the stitch you'd use for the heel flap except that I'm alternating which stitches are slipped each round -- in other words, I do (slip one, knit one) across for one round and (knit one, slip one) across for the other (with plain rounds in between). The result is a kind of Eye of Partridge section, which looks quite pretty and, I'm hoping, will wear longer. It's not quite this bright in real life/good light, but it's close. My other project currently on the needles is a hat for Halos of Hope. A number of the podcasts I listen to are participating in the so-called Podcaster Throwdown, so I thought I'd knit a couple of hats to throw on the pile. The first was actually cast on in the car on the way to D.C. on Christmas Eve, though it stayed at home when we went to Florida and didn't get any more attention until Sunday night. I figure I'm now about halfway done. The pattern is Wurm, and the yarn I'm using is some Knit Picks Comfy Sport that was leftover from a sweater I knit for Rainbow before she was born. I didn't have enough of one or two colors to do the whole hat, but there's enough scraps that I can combine them all, so this Wurm will be multicolored. Once this hat is done, I'm going to use some Wool-Ease that I found on clearance at Michaels a while back to knit an Amberson. My hope is to get both hats done this week so I can send them off on Saturday. Today is the last day of our vacation. Mother Nature must be preparing us to get back to the frozen north, because today it's chilly (for Florida standards) and rainy. It's a good day to stay inside, knit, and nap on the couch (though considering Rainbow is running around, I'll probably only get to do two of the three). This is as good a time as any to share my first finished object of 2014, a new pair of socks to fill in the holes (due to sock holes, hehe) in my sock drawer. I have knit this pattern enough times that I really don't need to refer to the pattern anymore other than to double check that I have the stitch pattern truly memorized. Unfortunately, I thought I knew it so well that there were times I just kept knitting and totally disregarded the pattern, causing me to need to tink back. Actually, I tinked once when it was only about two and a half rounds, but one time it was an entire pattern repeat, so I ran a lifeline and frogged back. Those did cost me a little time, but considering that I worked on another project at the same time, five days isn't bad for a pair of socks. I really love what the slip-stitch heel pattern does to variegated yarn. The yarn was a relatively recent purchase -- it arrived as part of a big order when I was at my LYS the Saturday before Christmas -- but it didn't even make it into the stash, so I think that's a win for me. I still have quite a few skeins of STR to knit, most of them from when I was still in the Rockin' Sock Club (which has to be at least three years ago, maybe even more). One of those skeins was purchased at MDSW last year, and it's been patiently waiting to be knit up. I've started another variation on the Monkeys; they're still no purl, but this time I'm knitting one repeat as usual and then starting the next repeat halfway across the chart (so on stitch 9 of 16). I like the effect I'm getting, and while the Monkey pattern is my old standby and I don't mind having many pairs of them, this is a nice little variation. This color is called Twitterpated, and I can assure you that it's every bit as bright in person as it appears here (actually, it might be even brighter considering how dim the light is here today). These socks will be great fun to wear on the coldest, darkest days of winter -- you know, the ones we'll get to experience when we get back home tomorrow. Can you tell I'm not looking forward to it? Happy new year! I hope you all had a good end to your year and are excited for things to come in the year ahead of us. These haven't been blocked yet, which is why they look a little twisted, but I love them. They're a new pattern that I'll be writing up soon; the yarn is Fibernymph Dye Works Bounce that I picked up at the Indie Knit and Spin in November. There's still at least half a skein left, so I may make a second pair (one to wear, one to keep nice for the sample) or knit another pair of mitts with a different pattern. I also brought two skeins of Socks That Rock with me to make some replacement socks. The first pair, in my old standby pattern (no-purl Monkeys), was cast on Sunday afternoon. At the moment, I'm just two pattern repeats and a toe away from a finished pair, and I expect I'll be done sometime this evening. As soon as these are done, I'll ball up the other skein so that I can cast on the other pair and have them on the needles for the flight home. I'm also putting myself on a fiber diet, at least until Maryland Sheep and Wool this year, because I have a ridiculous amount to spin up -- and that includes two fleeces that were bought a year and a half ago. They are beautiful fleeces, and I'd really like to spin them up and knit sweaters from them, but I haven't done so because the processing takes away time from knitting and spinning. I've combed a bit of one fleece, so I can at least start on that, but I think that I might set aside an hour or so a week and dedicate that time to combing or carding. I'm okay with having a long-term project as long as it gets done eventually. Do you have a theme or a resolution for the coming year? What at you hoping to accomplish in 2014?